Inspired by Markus Lüpertz’s dapper style when he was in town for the opening of his exhibition at The Phillips Collection, some of our staff decided to take a look at other artists known for their unique fashion sense. Today, we focus on Frida Kahlo. I would be remiss in not mentioning Mexican painter Frida Kahlo in a discussion of artists whose style influenced their practice. The nonconformist female artist, known widely for her vivid self-portraits, explored questions of identity, gender, class, and race in Mexican society. Kahlo often featured herself in colorful Mexican clothing, referencing her traditional indigenous culture and appreciation of her ancestry. The feminist icon’s style often reflected powerful and deeply personal moments in her life, whether it was admiration for her culture, the political climate in Mexico, her ailing body, or love and heartbreak. One of her works that is especially relevant to this topicis Self-Portrait with Cropped Hair (aka Short Hair, Don’t Care! 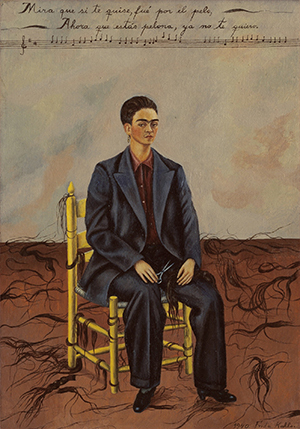 as I like to refer to it), which depicts Kahlo wearing an oversized men’s suit, instead of one of the traditional Mexican dresses that she is often shown wearing. Kahlo created this work while separated from her partner Diego Rivera. Frida Kahlo’s celebration of the female form, down to her un-manicured eyebrows, continues to inspire artists today.